Clafoutis is a french dessert of fruit covered in a thickish batter which is then baked in an oven until puffy and golden brown. Typically, black cherries are used to make clafoutis, but you can actually use any other stone fruit instead. I used plums as I had a lot available and they worked really well. 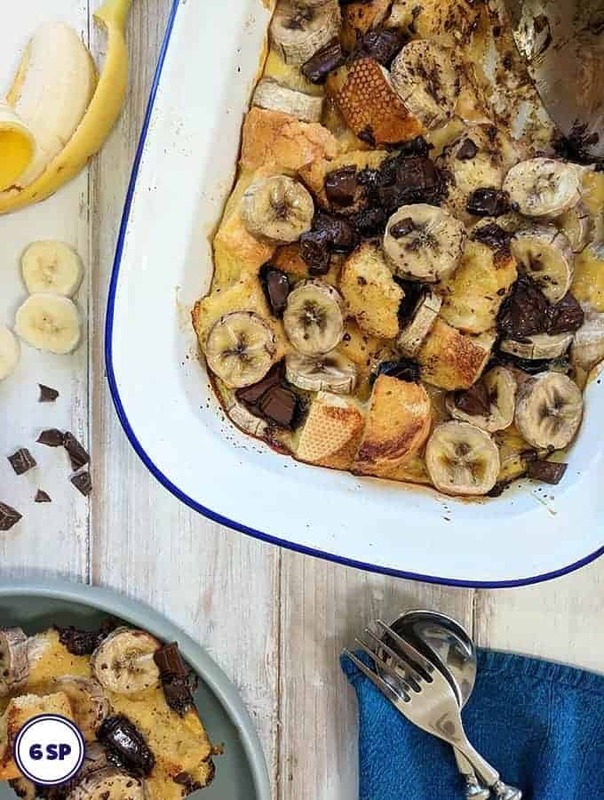 Traditionally clafoutis is made with whole milk and butter. Recipes also often include whipping cream! Obviously that’s not ideal if you are following the WW plan! I played around with the recipe to omit those high point ingredients. 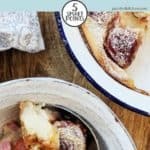 I was very keen not to change the texture of the dessert or the way that it tastes too much and I think I have managed that with this recipe. 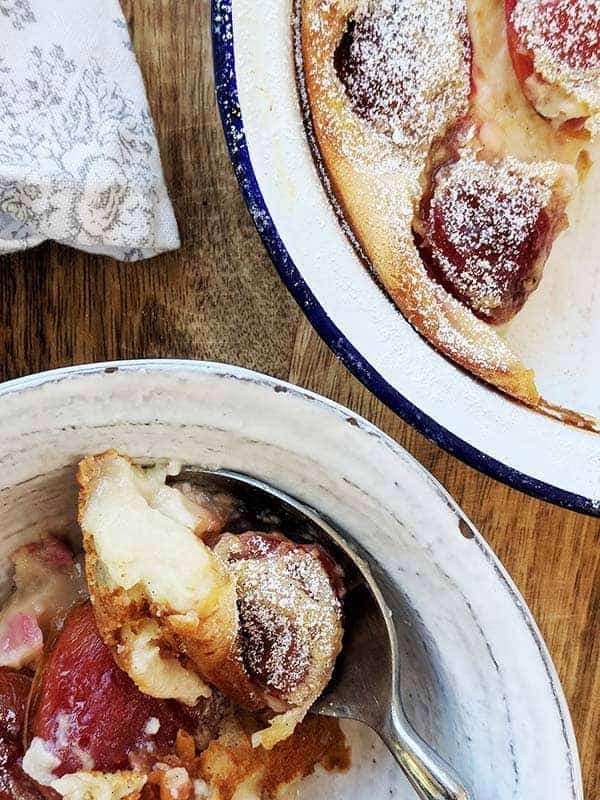 The batter, when baked, turns into a creamy, wobbly custard that surrounds the sweet plums. Yum! As I said before, I have actually been know to eat this dessert for breakfast. 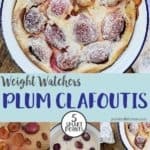 A similar French dish, Far Breton, is served for breakfast, so I figured why not eat Plum Clafoutis for breakfast too! 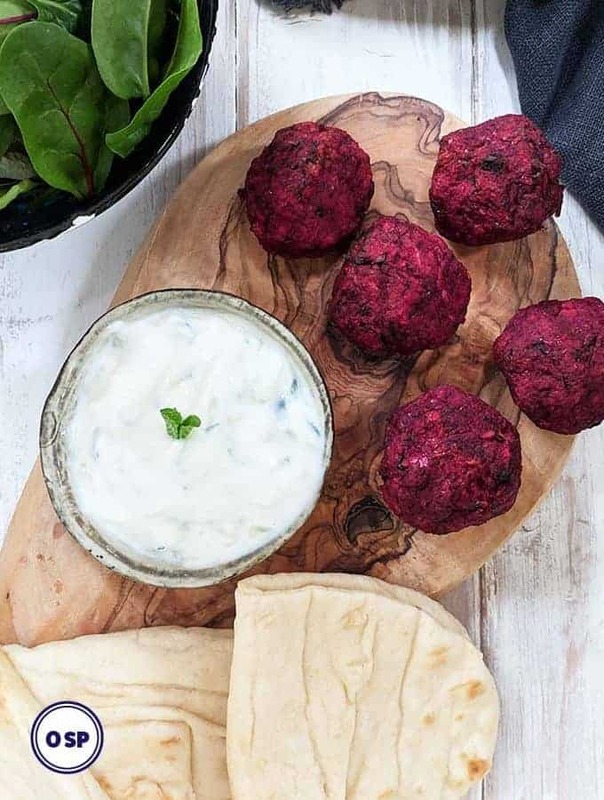 Swap the plums for a different stone fruit, such as cherries, apricots, peaches etc. Use caster sugar / fine sugar instead of icing sugar / powdered sugar for the same amount of SmartPoints. 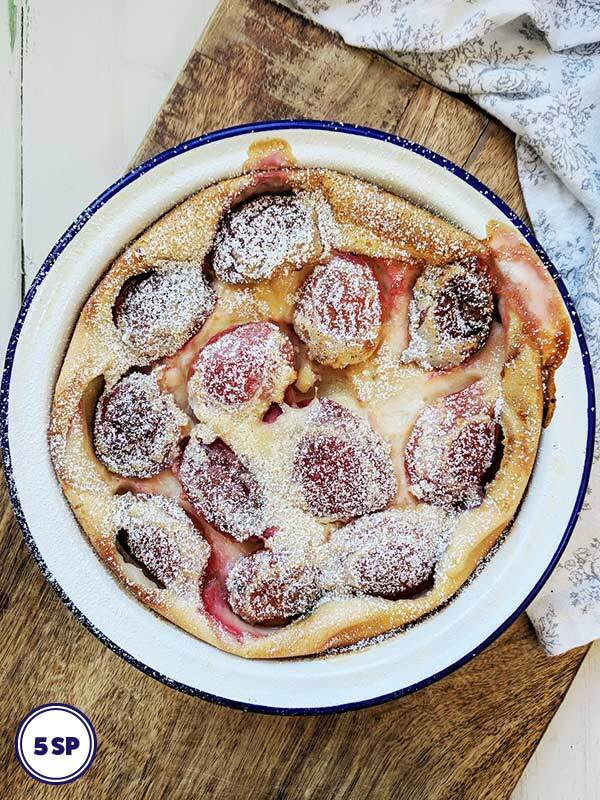 I used this cute Enamel Pie dish, available from Amazon, to make this clafoutis. I used a handheld whisk, like this one, to whisk the batter. 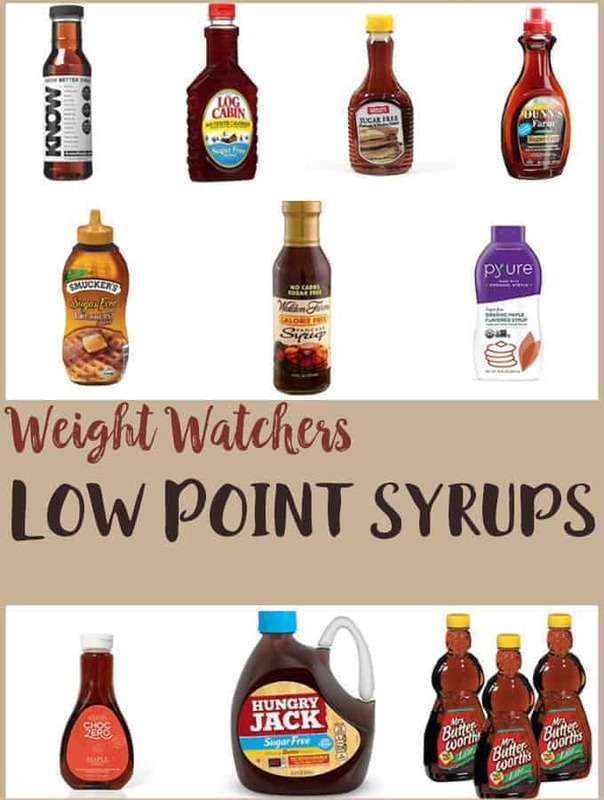 An easy & delicious dessert, just 5 SmartPoints per serving on Weight Watchers Freestyle / Flex plan. Preheat the oven to 375oF / 190oC / 170oC Fan. Half the plums and remove the stones. Spray the bottom of a 7 inch pie dish with spray oil and place the plum halves cut side down in the pie dish. In a bowl whisk the eggs until they are light and frothy (3 - 4 minutes). Add the vanilla paste, salt and skimmed milk and then add the flour and sugar, little by little, whilst continuing to whisk until you have a smooth batter. Pour the batter over the fruit. Place the pie dish on the middle shelf of the preheated oven and bake for 10 minutes. After 10 minutes reduce the temperature to 300oF / 150oC / 135oC Fan. Bake for a further 30 - 35 minutes until the Clafoutis has turned golden brown and has puffed up. Remove from the oven and cool for a bit before dusting with 1 teaspoon of icing sugar / powdered sugar. 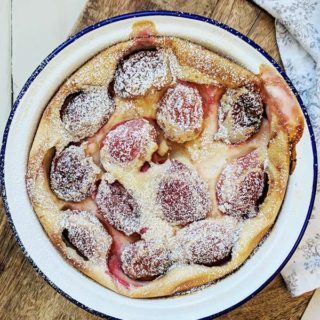 The Clafoutis is best served when still warm, although it also tastes great when cold! The Clafoutis will puff up when it is cooked, but will deflate once is taken out of the oven - this is totally normal.